Sri Markandeya Dharma Sastha Temple in Kallampally street, Vazhapally, Fort, Thiruvananthapuram, popularly known as Kallampally Sastha Temple, is a famous and ancient temple in Thiruvananthapuram City. The uniqueness of this temple is that inside the main sreekovil there are prathishtas of Sastha and Siva and also Sivalinga in the right hand of Sri Sastha. The belief is that Sastha is worshipping Siva. The deity is known as Markandeswaran on accountant of this. For the same reason sanidosha nivarana poojas like neeranjanam, saneeswara homam are found very effective. In addition the devi prathishta in rajarajeswari bhavam and ganapathy prathista for vignanivaranam and navagraha prathishtas for graha dosha nivaranam add to the chaithanyam and importance of this temple. This ancient temple was renovated in 2010 as per the directions of the temple acharyas. The renovation included the reconstruction of the upadevalayas and punaprathishta of devi and ganapathy vigrhas and new navagra prathishta. In March 2010 ashtabanda kalasa and kumbabhishekam were conducted. 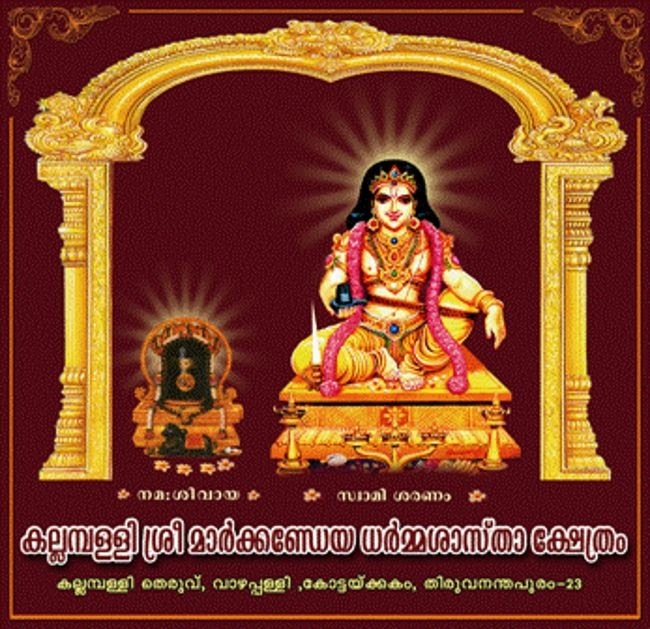 The different methods of worship and concept of god, the ultimate reality, in kerala temples are unique and wonderful. The kallampally sastha temple is a typical example for this. 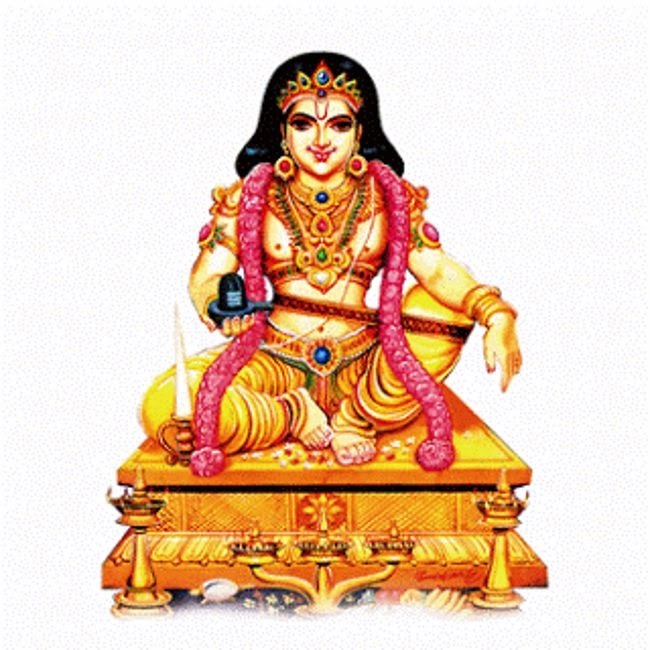 The sastha deity in the center of the srikovil is having sivalingam in the right hand, the right foot is bent, left foot is bent and leaving a belt to the side. This is a sreekovil where the deity is in Dyanasanam (Meditation Pose). The prathista here can be said to be a very rare one generally in the right hand abhaya mudra is seen. But here dharma sastha is having siva linga in right hand. which is in prapanja bhava. This sastha is known as markandeya sastha having controlled the prapanja sakthi in the eye, and having the shade of nagadeva’s five goods on the fiery eye is the appearance of this lingam. This sivalingam represents the vast and limitless sakthi. Perhaps this is all comprehensive fully manifestation of sivam. Another sivalingam is also inside the sreekovil which is prapanja purusha roopa and which is protected by five hoods of a serpant and which represents the five indriyas. Here the sastha deity also worship this siva bhava. Here the vahana of sastha is elephant. It is considered that this temple is older than the temple of sri padmanabha. Not only that, in divine power and chaithanya sri dharma sastha here stood first according to potty of Nethaseri Mana who owned this temple. According to a legendery strory told by sri. Krishnan potty of Nethassery Mana, the power of sri. Markandeya Sastha is indicated as follows. The prathista of sri. Padmanabha Swamy could not be made firm and it was realized that there was a more strong saiva chaithanyam in the area. That was why the vigraha prathishta could not be done. Further probe revealed that the mahasakthi is that of markandeya sastha. Then sastha preethi was performed for 41 days and after knowing the full consent of the saiva chaithanya only the prathista could be made firm satisfactorily. Sri Markandeya Dharma Sastha Temple in Kallampally street, Vazhapally, Fort, Thiruvananthapuram, popularly known as Kallampally Sastha Temple, is a famous and ancient temple in Thiruvananthapuram City.